Large companies are… well… they’re large. They have lots of employees, lots of customers and lots of data, systems and processes. You might think, therefore, that global companies would apply their scale to apps. Think again. While smaller companies look at their large competitors and assume they are slow, cumbersome and uncreative, that’s not our experience. We’ve been meeting with executives from very large corporations and we’re seeing a new way of thinking about building, deploying and aggregating apps. Yes, I said aggregating. The IT industry has been promising to improve productivity since the 1970s. Great strides have been made. Information Technology has greatly increased both desktop productivity and centralised data processing and management. In the 1990s and noughties, obsession with process re-engineering and the IT that supported it also made big productivity gains. Mobile data is driving today’s productivity opportunity. Now, it’s simple to access, process and provide data anywhere from a device that lives in your pocket. I’m talking about mobile apps for enterprise. Any company of any size can make almost immediate productivity gains by using mobile enterprise apps. But, it’s only immediate if they think small to act fast. The easiest and lowest risk way of mobilising data is doing it one process at a time; creating discrete apps for discrete services. 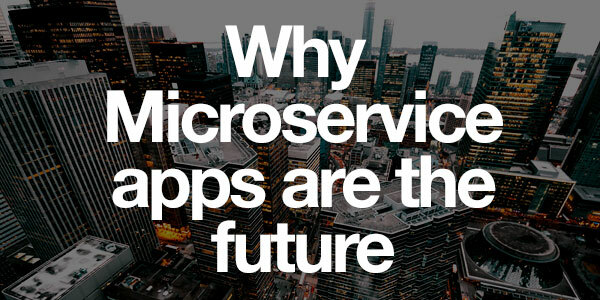 Let’s call them Microservice Apps. That’s thinking small and it’s what we’re starting to see more and more of in our Enterprise clients. Thinking small and specialist isn’t new to enterprise either. Multi-sourcing has been around since 2005. What is Microservice App Aggregation? App aggregation is a totally new way of thinking about building and deploying mobile data solutions. It’s a very flexible and agile way of working which allows apps to be developed quickly and cost-effectively. App aggregation is the end result of a Microservice App strategy. We discuss development of a Microservice App for SB Rail in this case study. Microservice Apps are small apps that manage discrete services. 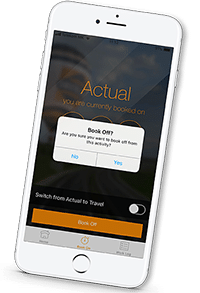 In the case study, the app is a digital version of a repair log book. Other examples of Microservice Apps might include; timesheets, skill and certifications, health and safety training logs, site audits etc. The critical part of the aggregation concept is that apps are kept small and developed one at a time. Where a more traditional approach to enterprise apps might try and wrap (or aggregate) multiple processes in one app, Microservice App Aggregation uses the device to aggregate functionality using discrete apps. The alternative is a more traditional approach which goes something like this. First, a team is assembled to ensure stakeholders from all relevant parts of the business are represented. Together, they produce a scoping document and define the functionality they each want. They wrap that into an RFP, then run an extended procurement tendering process. By the time the tendering document is complete, a company adopting the Microservice approach could be deploying its first services. So, when does MAA work for enterprise and when is a more traditional approach needed? When does MAA work for enterprise? MAA is not a panacea, it’s important to state that. There are times when a big app is needed. Sometimes the scope of what needs to be achieved is just too large to adopt a Microservice approach. Typically, it depends where the driver for digital transformation is coming from. Centrally-led core system or process transformations typically require a larger scope. In those circumstances, we’d generally offer support by hosting a team of dedicated technicians in our offshore development centre in Skopje. This allows the corporation to operate its own team, using its own resource which works far better for large scale projects. Department or unit-led initiatives lend themselves perfectly to an MAA approach. By adopting the principles espoused in Agile methodology, specifically the concept of Minimum Viable Product (MVP), a development roadmap can quickly be developed which focuses on the biggest wins first. MVP makes it easy to be ruthless and strip out superfluous functionality. Thus, a series of small Microapps are developed to tackle discrete processes. 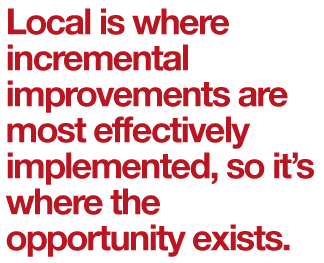 Local is where incremental improvements are most effectively implemented, so it’s where the opportunity exists. MAA is a bottom-up approach to digital transformation. It says that the people on the ground, those using data day-to-day, are the best-placed people to improve productivity incrementally. With the right impetus and support, it’s where creativity and focus can create great gains. Mobile apps devised and developed by teams to address core processes tend to be small, simple, fast to build and low cost to deploy. They have high adoption rates because they are very focused, easy to use and genuinely help the users. If you’d like to see an excellent example of this, check out our case study on SB Rail. MAA as a strategy is about embracing and aggregating marginal gain. In the same way that Netflix and other early adopters are using Microservices architecture to deliver a Big service, enterprise can use Microapps to deliver change. It’s less risky, less expensive and more adaptable to future change. How small can you be? 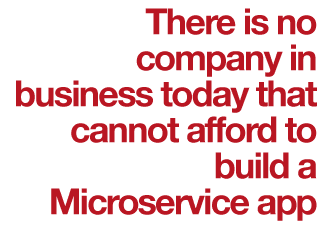 There is no company in business today that cannot afford to build a Microservice app. And, every 200-person plus company should be building Microservice apps if they want to improve productivity. Budget is often what puts companies off. The right question is: “how small can we be”? Or maybe, how small does a project need to be to make it a no-brainer? Let your people be creative. Challenge them to think small. Task them to make marginal gains, then aggregate that gain. Development companies normally try and persuade their clients to increase the size and scope of their projects. We’ll do the opposite because we believe in MAA. MAA enables more creativity, entrepreneurialism and dynamism because it is highly, highly focused on discrete tasks. If you like the Microservice app aggregation approach and want to find out more, please drop me a line or check out our pages on app development. We’re planning a webinar series on this very subject, so please let me know what you’d like us to cover. 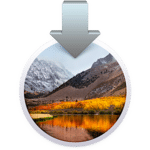 Previous Post Is it possible to prevent conversion to APFS when upgrading to High Sierra? 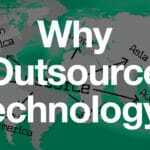 Next Post Outsourcing Part 1: Why Outsource Technology?